The winning 2010 AHS student design team. The AHS competition challenges students to design a vertical lift aircraft that meets specified requirements, and promotes student interest in vertical flight technology. The first- and second-place teams are awarded a cash stipend and two members of the winning team are invited to the AHS Annual Forum and Technology Display to present the details of their proposal. 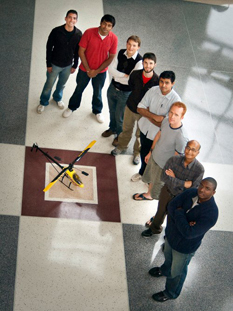 The winning team from the Clark School's Alfred Gessow Rotorcraft Center, included student team members Rajan Sharma, David Mayo, Ben Berry, Graham Bowen-Davies, Vincent Prosbic, Ananth Sridharan and David Pfeifer, and faculty advisors Inderjit Chopra and J. Gordon Leishman and VT Nagaraj. Second place went to Georgia Tech. The hover flight test results for the team's technology demonstration entry can be found online. The NASA competition encourages students to design tools and instruments needed for future human and robotic exploration of the moon. Student projects tackle real problems required for successful lunar missions such as navigation in the darkness around the Moon's south pole, sample retrieval and on-site analysis and astronaut recovery and transport back to outpost. This year's winning team is comprised of students from the University of Maryland's Space System Laboratory and Arizona State University. The team won first place for the design, fabrication and testing of the RAVEN astronaut assistance rover. The award consists of summer internships, to be filled by Kevin Buckley from UM and Lauren Puglisi from ASU, who are working with the teams developing systems for the NASA Desert RATS testing in September. Faculty advisors were Dave Akin and Mary Bowden. "We can all be proud of our student teams and their tireless faculty advisors in the Baja, AUVSI, AHS and NASA competitions," said Dean Darryll Pines. "We've shown once again that, in tough competition against other excellent schools, our Clark School students and faculty are second to none."